Whether you enjoy ruby flushed sunsets sweeping through hemlocks and fresh rhododendron blooms, or challenging climbs through murals of eroded sandstone, our maps will take you there. Perhaps the best map ever made with a complete remake for the 5th edition. August 2018 update: we have released our latest version of this popular map! Our maps are available laminated for superior durability. We use the highest quality laminate and a heat press to guarantee that folded laminated maps fold flat. 1:15,840 scale map set — significantly more detailed than any other map! I was hiking Red River Gorge last year with some printed out maps, which mostly did the job but definitely could have been better. While on the trail I talked with another hiker who was using one of your maps. I got your company info from him and later ordered the laminated RRG maps. Great investment, best detailed maps I’ve seen. These maps are great. The quality is great, the accuracy is great. The understanding of what to expect on your trip, points of interest, and accuracy made our trip turn out great. I recommend the laminated, which I did not get. The non laminated maps are very high quality but for use and waterproofing its worth the extra expense. There is no better map for the Gorge. If you’re planning a trip, or several trips to this area. This should be your guide. I have some I ordered years ago, and just ordered the updated versions. I wish I had the time to buy the maps and explore every area these guys have made maps for. 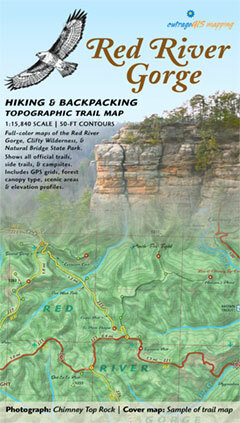 These are by far the best maps for Red River Gorge and I don’t hit the trail without them. The view points and other points of interest are marked and accurate. Something not found on other maps. The unofficial trails detailed on the maps are also a very nice feature. I highly recommend these maps! The customer service with OutrageGIS is phenomenal, another reason to support this local business!